News from Bob Cury at RJC Yachts that he's listed for sale the 25.6 metre luxury yacht Shani Tot. Built by US yard Lazzara to a highly customised in-house design, she was launched in 2007 and has an interior in high gloss pecan wood throughout. There is al fresco dining available on the large aft deck while an expansive saloon has floor to ceiling glass doors, comfortable brown leather furniture and a full entertainment centre with television and DVD. Forward, the dining area has seating for six guests. The expansive flybridge has teak tables under the hard top and aft in the open air with a hot tub, bar, fridge, ice maker and electric grill for more al fresco entertainment. Accommodation is for 10 guests in a five stateroom layout configured as a master suite, port and starboard VIP staterooms, a double and a twin and all have en suite bathroom facilities. 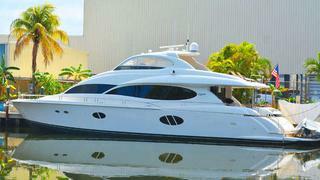 Twin 1,550 Caterpillar engines give her a cruising speed of 27 knots. Currently en route to Sag Harbor, New York, Shani Tot is asking $2,950,000.